In brief: Michael Booth has just taken out the “12 Towers” race in Australia for the second year in a row, defeating Lincoln Dews and Ben Tardrew to extend his winning streak and cement his status as the world’s #1 dark horse. 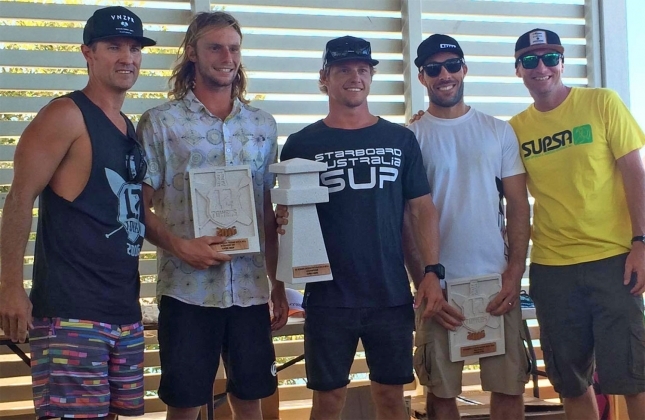 The Starboard team rider and defending Australian champion took the win on an epic downwind course, after wild weather on the Gold Coast forced organisers into a late change of venue that turned out to be a blessing in disguise. Linc had a very solid hit out on his first race as a JM Paddleboards team rider, while Ben channeled the bump riding skills of his famous NSP team mates to round out the podium. Former Battle of the Paddle top three finisher Karla Gilbert triumphed in the women’s race. The 5th annual edition of the event was moved north to Brisbane’s more protected Moreton Bay after ex-Cyclone Winston (the storm that flattened Fiji) turned the Gold Coast’s open oceans into a washing machine. However the change of venue ended up producing an awesome downwinder, with Moreton Bay proving once again it’s one of the most underrated downwind runs going round.